Daily care for normal to combination skin, HYDRALBA light moisturizer provides lasting hydration and protects the skin from climatic stress through the action of Rhealbose exclusive, 100% natural plant complex isolated by the Dermatological Laboratories A-DERMA. Specially designed for normal to combination skin, light moisturizer Hydralba meet the desired balance between comfort and lightness. It hydrates the skin while providing a feeling of freshness to the application thanks to the subtle aspects of gel texture. This fluid emulsion is quickly absorbed through the skin and leaves a dry feel and non-greasy, delicately scented. The skin is hydrated, soothed and protected. 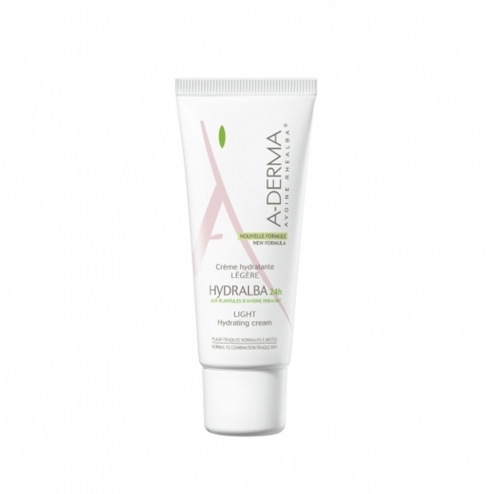 Apply Aderma Hydralba light moisturizer morning and / or evening on face and neck after cleansing. For hygiene reasons, we recommend that you reseal the product after use.